On June 6, 2016 Indianapolis City Council passed a resolution recognizing the importance of pollinators and urging the city of Indianapolis to refrain from the use of neonicotinoid pesticides. Save the Bees Indiana is working to increase awareness about pollinator decline and the inextricable link between pollinators and our food system. One in every three bites of food we eat is made possible by bees yet their numbers are declining due to pesticide use, habitat loss and climate change. In collaboration with Earth Charter Indiana and the Arts Council of Indianapolis, Save the Bees Indiana raises awareness about the plight of honeybees and pollinators through art, advocacy, and action. This program is made possible in part thanks to a SustainIndy Community Grant Program. Since August 2015, we've made more than 30 interactive classroom presentations (reaching 1800 students) at Indy-area schools on the importance of pollinators to our everyday lives, why they're in trouble, what we can do to help. In April-May 2016, 4th and 5th grade students from more than two dozen schools created honeybee sculpture art exhibit at the Artsgarden in downtown Indianapolis. 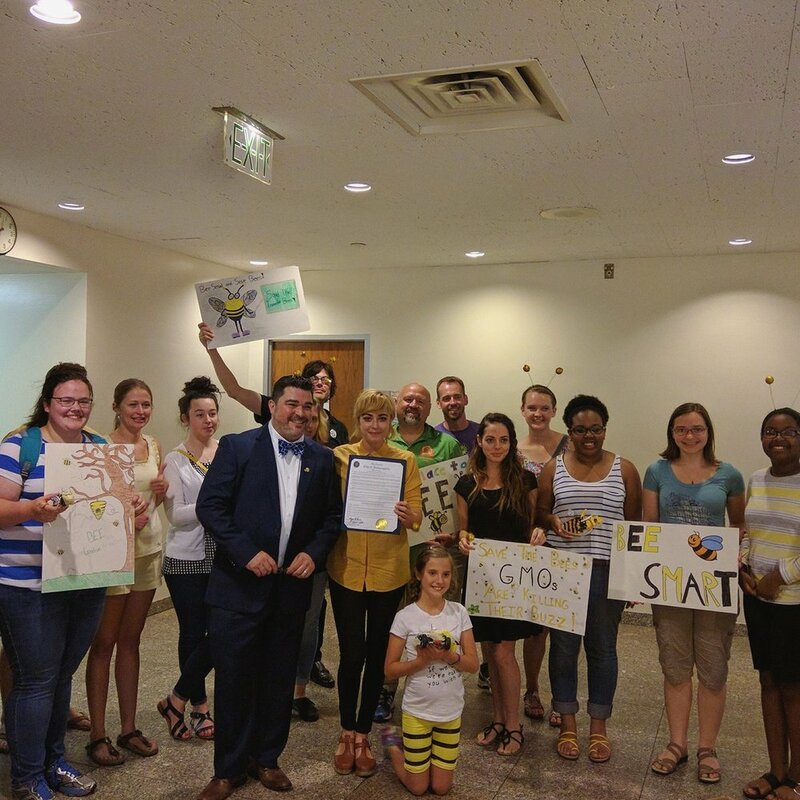 On April 22, 2016, Mayor Joe Hogsett made a bee-friendly city proclamation on Earth Day did a bee "waggle" dance with elementary students. On June 6, 2016, Indianapolis City Council passed a resolution recognizing the importance of pollinators and urging all departments to refrain from using neonicotinoid pesticides. Students were also in attendance for this and 9-year-old beekeeper Abigail gave an impassioned speech. In the spring of 2016, we installed beehives at four area schools. Each school's Bee Team (made up of students, teachers, and parents) receives one-on-one training and support from our beekeepers to ensure healthy, happy honeybees. Keep up with us on Twitter, Facebook, and Instagram.